Seven Days until the Anand vs. Kramnik 2008 World Championship Match. I am revisiting a game they played in 2007 at the request of several fans of my blog. 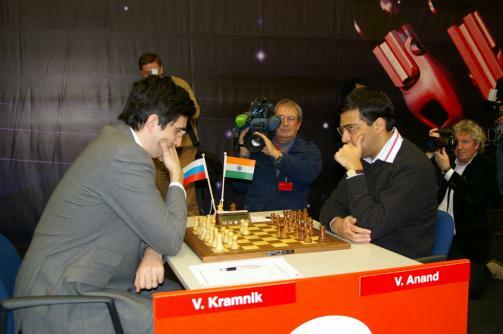 Kramnik-Anand 9/13/2007 was a Moscow variation of the Semi-Slav Defense. The Moscow variation which starts after 5…h6 can lead to very sharp play especially because Anand gambits a pawn by playing 6. Bh4. This game was identical to a 2006 game between Radjabov and Anand for 16 moves. Then Kramnik played 17. Qh5. Anand answers by sacrificing an exchange to achieve a position where he obtains a powerful knight and an extra pawn with move 21. Rxd6. If Kramnik had played 29. Qg5 play would have continued 29…Ne2 30. Kh1 Qh2 31. Kh2 Rh8 32. Qh4 Rh4#. Another example of the difference between the chess elite and the rest of the world. The resulting end game shows how a powerfully placed knight can equal a rook. Kramnik missed 35 Qh6! after 35…Qd6 36 Qxg5 f6 37 Qg8 Rd8 38 Qh7 Rd7 39 Qh4. After running computer analysis on that line I feel Kramnik would have had much better winning chances. 9. Be2 Bb7 10. O-O Nbd7 11. Ne5 Bg7 12. Nxd7 Nxd7 13. Bd6 a6 14. Bh5 Bf8 15. This entry was posted on October 7, 2008 at 6:44 am and is filed under Anand vs. Kramnik, World Chess News. You can follow any responses to this entry through the RSS 2.0 feed. You can leave a response, or trackback from your own site.